Finding Alphas seeks to teach you how to do one thing and do it well  design alphas. 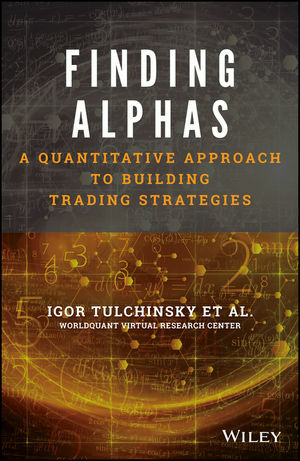 For financial engineers, quantitative researchers, investment analysts, and those aspiring to be quants, this is the guidebook for reliable, up-to-date coverage on the ins and outs of alpha design. The seven habits of highly-effective quants. A full treatment of all the key technical aspects of alpha design. The know-how to develop a disciplined process for alpha discovery and securities trading. A web-based simulator, WebSim ®, for creating and fine-tuning successful alphas. As the amount of data continues to grow in the financial industry, the advantage will go to the trader who can see the whole picture, who can combine millions and billions of subtle and illusive signals, and who has honed their skill set with the information provided by Finding Alphas. IGOR TULCHINSKY is the Founder and CEO of WorldQuant, LLC, a private institutional investment management complex with offices worldwide. He is also Founder of the WorldQuant Foundation, which offers scholarships to outstanding students committed to pursuing higher education in the fields of science and quantitative studies. Based on the belief that education should be free for all, he has also founded WorldQuant University, which offers a tuition free open online master degree program in quantitative finance.